SAN FRANCISCO -- Peloton Technology, a startup backed by Intel Corp., Magna International and others, is raising more cash to fund its bid to improve highway safety and generate huge savings for the US $700 billion trucking industry. 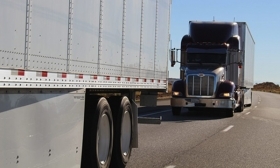 The Mountain View, Calif., company has created technology that makes it less dangerous for trucks to travel in close proximity to each other, enabling them to cut wind resistance and fuel costs. It's about to close a US $60 million round of funding that includes an investment from Intel, the world's biggest chipmaker, according to people familiar with the matter. Omnitracs LLC, a truck fleet management spinoff from Qualcomm Inc., said it's leading the new investment round. Peloton is aiming for commercial deployment by the end of this year, Chief Executive Officer Josh Switkes said in a phone interview. He declined to comment on the funding round. The company has been working with regulators, truck operators, vehicle manufacturers and other technology providers to perfect its system via on-road and track-based testing, Switkes said. "We are finishing validation of a real product," he said. "It's hard to make a safety critical system like this a commercial product." Denso Corp., Volvo Group and UPS Inc. are also investors in Peloton. Peloton's technology tracks the location of vehicles and then matches up trucks headed in the same direction at the same time. When they meet, the system takes control of breaking and acceleration to allow them to travel nose-to-tail and avoid collisions. Their drivers remain in control of steering. According to the company, its technology allows a saving of seven per cent in costs when trucks are traveling at 100 km/h (65 miles per hour). About 40 per cent of the expense of operating long-haul fleets goes to fuel. The system also helps keep everyone safer as it eliminates the delay humans create between recognizing the need to slow down and hitting the brakes, Switkes said. The truck in front tells the one following to brake electronically. Peloton's system also arranges trucks in a platoon in order according to their braking ability, checks the local weather conditions to see whether it's safe to team up at all and lets vehicles convoy only on roads that have been cleared as safe for such a system. The company will charge truck companies fees for installation and per mile of platooning. The savings in fuel are created through aerodynamics. Putting the trucks close to each other and using radar sensors and wireless communications reduces turbulence and drag. The company believes its technology is a step on the way to full automation, which it will work on in the future. Omnitracs is planning joint deployment of Peloton's technology.